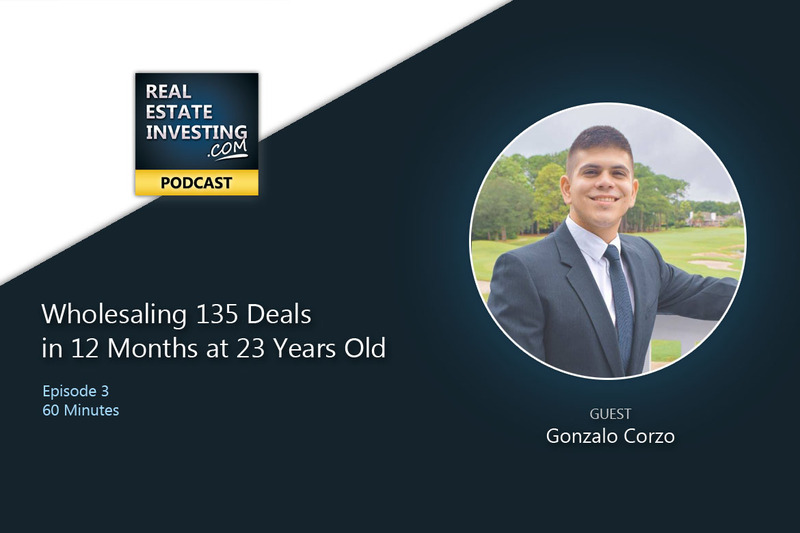 Grab something to start taking notes because Gonzalo Corzo lays it all out on how he is crushing it at wholesaling real estate in the Jacksonville area. This “no-holds-barred” interview takes a close look at how Gonzalo has shadowed & learned from other highly successful investors & then took action to build a highly successful systematized wholesaling business. Gonzalo tells what it really takes to be a successful wholesaler & leaves no detail hidden. Come along on this information packed podcast where he outlines in detail each component of his business, the software programs he has implemented, along with how him & his team finds & vets 10 or more deals a month on a consistent basis. If you want to be a real estate wholesaler, this is one interview that can change your life if you take action! * If you are passionate about wholesaling & you like the episode, PLEASE SHARE! We really appreciate it! Gonzalo does more deals than most other wholesalers not because he knows more, but because he takes more action. Persistence is the key to success in real estate investing. Keep a good mindset by not listening to the naysayers. Work to learn (even for free) before you work to earn. FlipLender.com Direct access to funding for your flips. How Gonzalo got his start in real estate investing. The strategy he used to shadow & learn from highly successful investors. How he worked for free to learn the ropes from a mentor. What his first deal looked like. The team structure he has built with his partner. Gonzalo's strategies for using VAs (Virtual Assistants). The strategies he is using to find deals & which strategy is working the best. An in-depth look at the software & systems he has in place. How to lock up a deal before you ever see the house. What to do if you can't find a new buyer before you have to close. When to double close vs when to do a single closing. How to network & build a buyers list full of cash buyers. What Gonzalo consider's his best deals he has done. The worst deal he did, the mistakes he made & what he would do differently. How Gonzalo learned to do what he does at such a young age. The mindset that drives him to success & how he makes sure he keeps his eyes focused forward. Wholesaling Real Estate: The strategy of putting a real estate property under contract and then assigning that contract for a fee, usually at the closing. Because the wholesaling investor has an “equitable interest” in purchasing the property, they do not need a real estate salesperson license to sell the purchase contact. Double Closing: A real estate closing technique which involves a first closing between the owner of the property and the wholesaler, and then a second separate closing between the wholesaler and the end-buyer; the deed from the seller is to the wholesaler and then the wholesaler signs a deed to the end-buyer. A double closing involves two sets of closing documents and two deeds. Single Closing: When wholesaling, a “single closing” means the deed passes from the seller to the end-buyer and the wholesaler gets an assignment fee. There is usually one set of closing documents and one deed. Conducting the closing can be separated into two meetings; one where the seller signs the closing documents and one where the end-buyer signs, ensuring the seller and end-buyer do not meet face-to-face. VAs / Virtual Assistants: Workers who perform tasks remotely from home by computer or phone, usually from another country. This author hasn't written their bio yet.wholesaling-135-deals-in-12-months-at-just-23-years-old-with-gonzalo-corzo has contributed 104 entries to our website, so far. View entries by wholesaling-135-deals-in-12-months-at-just-23-years-old-with-gonzalo-corzo.